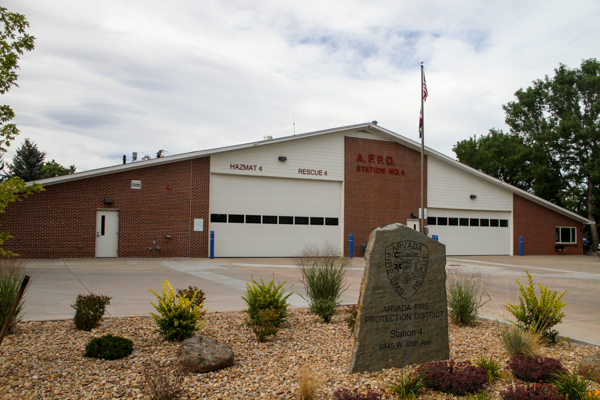 Fire Station 54 is located at 6845 W. 68th Avenue, and dedicated in 1963. 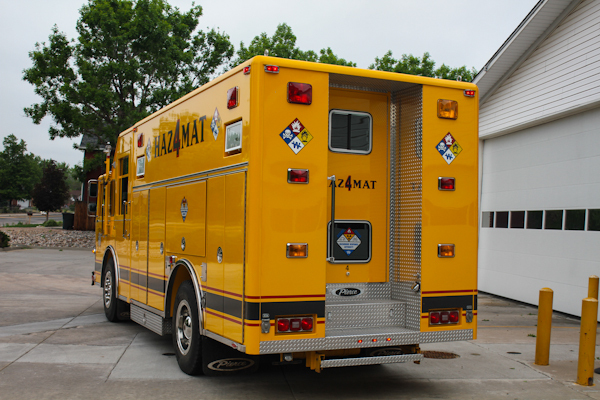 Station 54 is home to the Hazardous Materials Team. 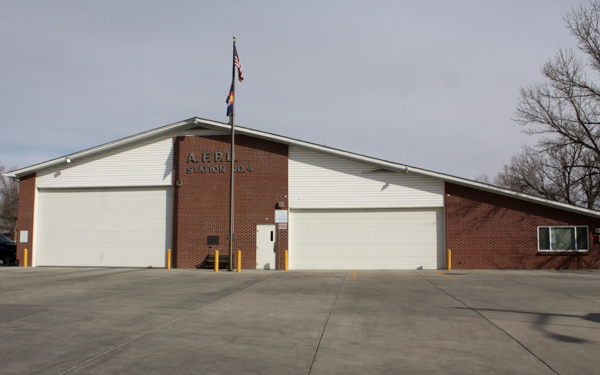 Fire Station 54 was renovation to increased the size of the station and modernize the facilities in 2014. 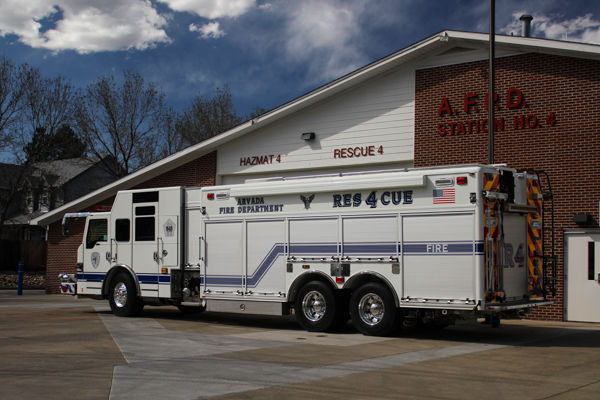 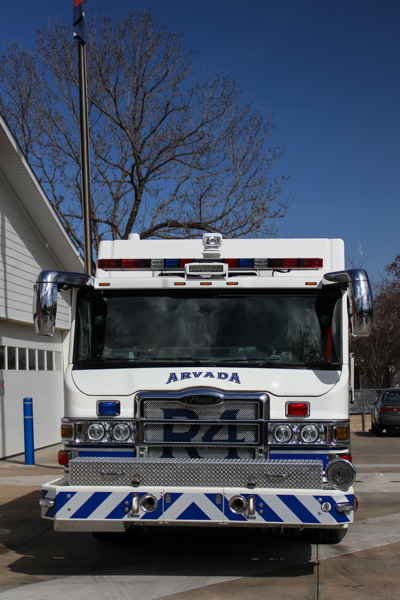 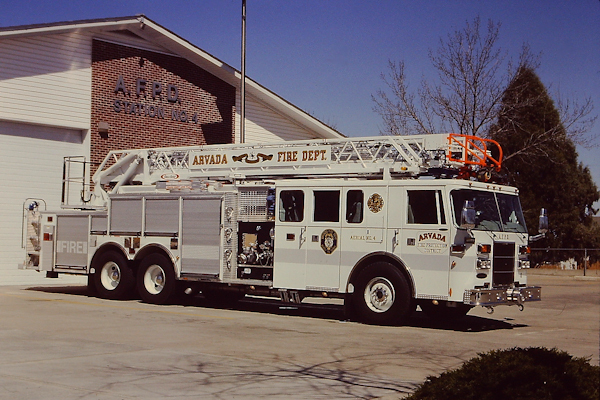 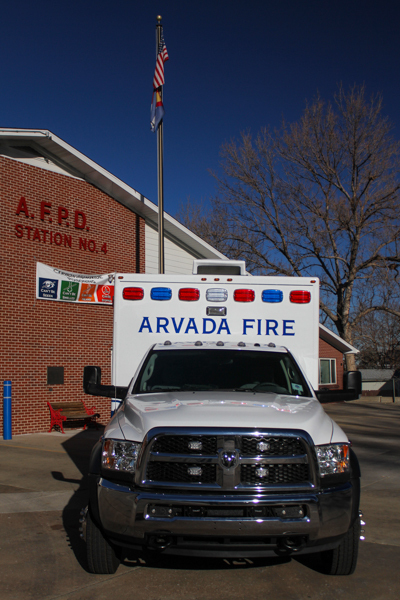 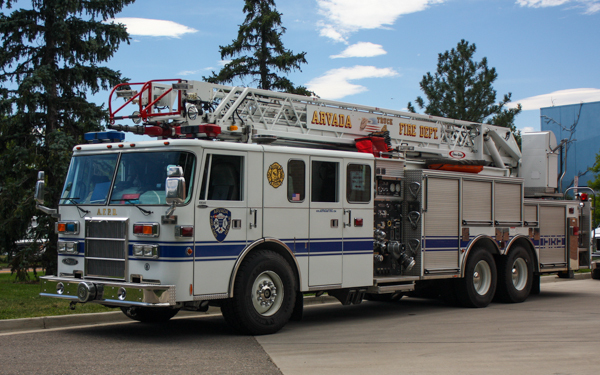 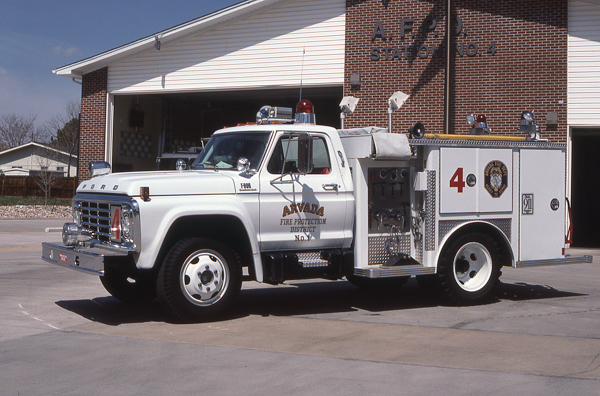 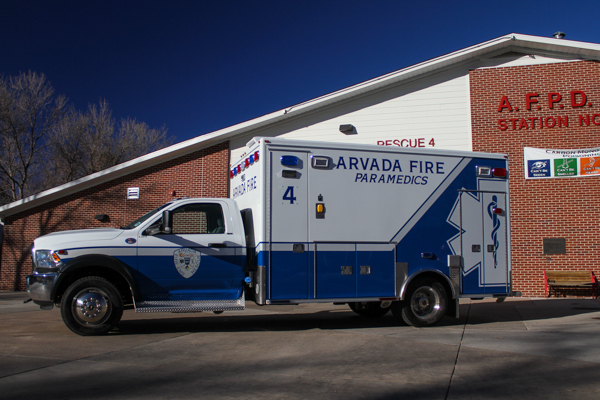 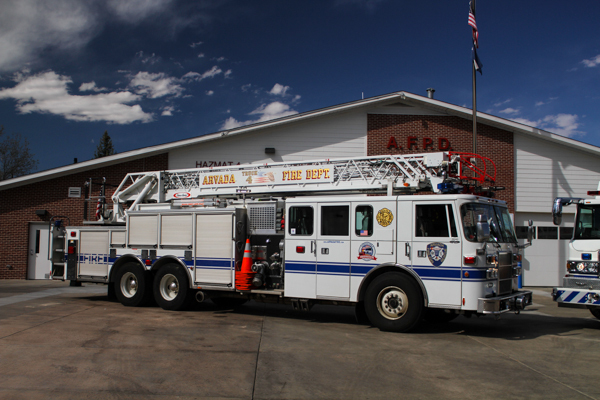 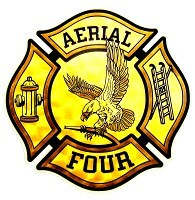 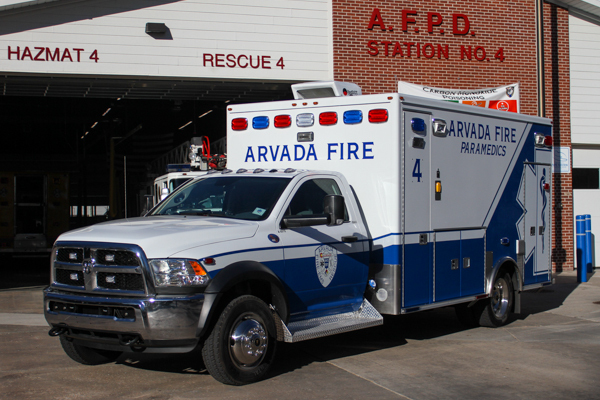 Station 54 is a member of the Adams/Jeffco Hazardous Response Authority and the North Area Technical Rescue Team. 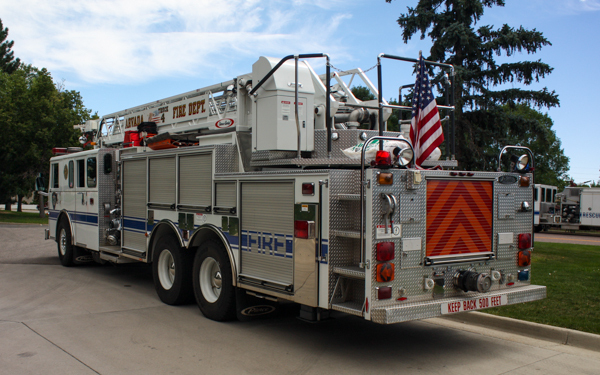 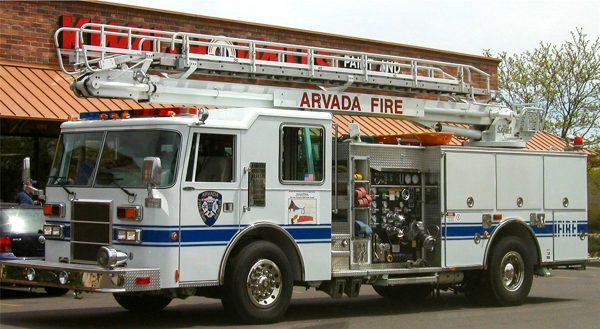 2001 Pierce Quantum, and refurbished in 2019 by Fire Trucks Unlimited (1381). 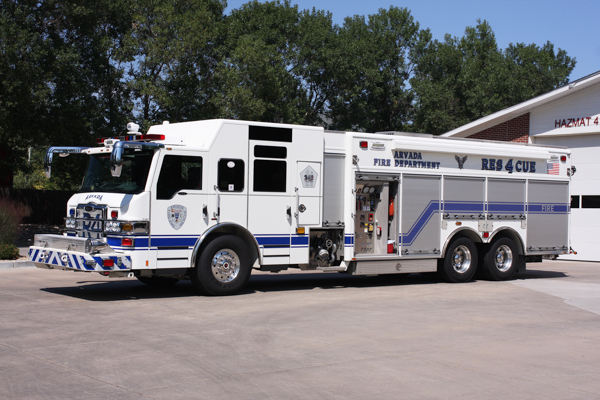 (A-0010) 2018 Dodge Ram 4500 4×4 / MedTec, remounted and refurbished in 2018 by Fire Trucks Unlimited (1699). 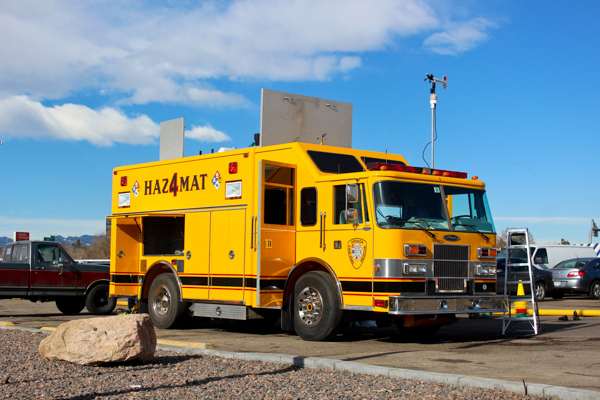 1994 Pierce Saber (E9616), former Rocky Flats Fire Department Haz-Mat 1. 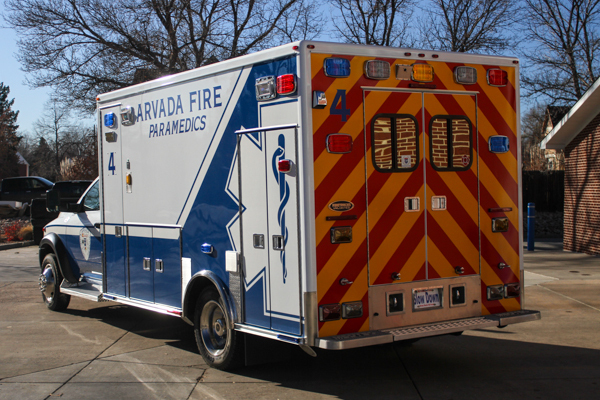 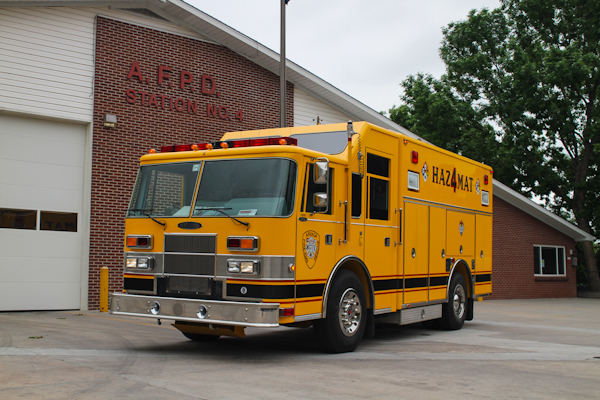 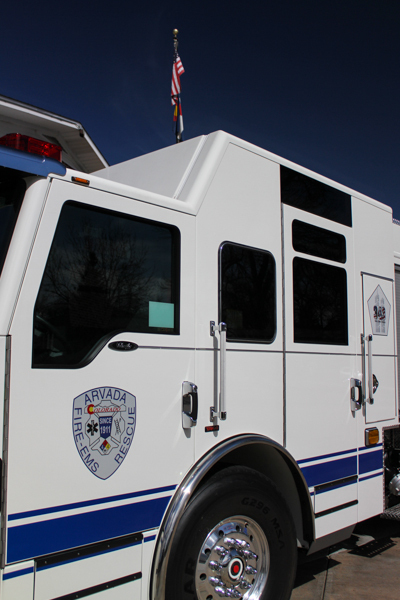 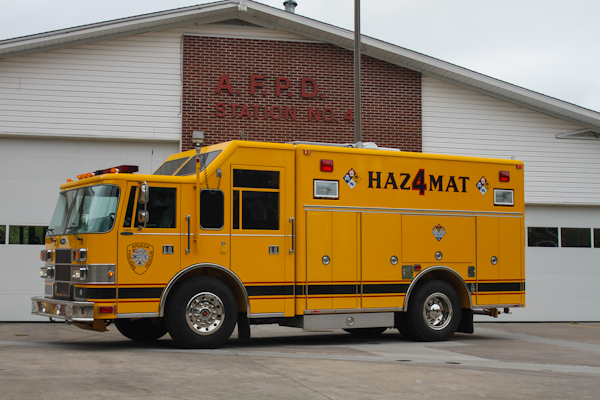 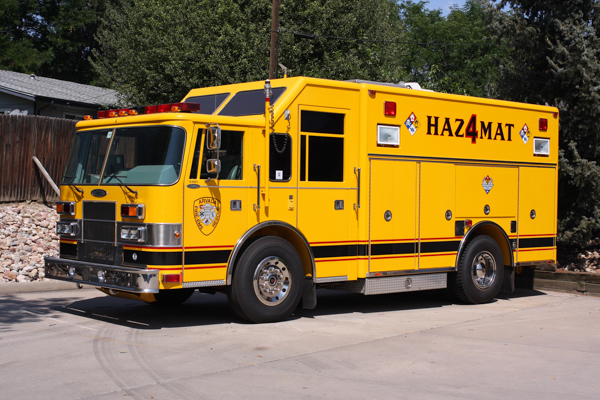 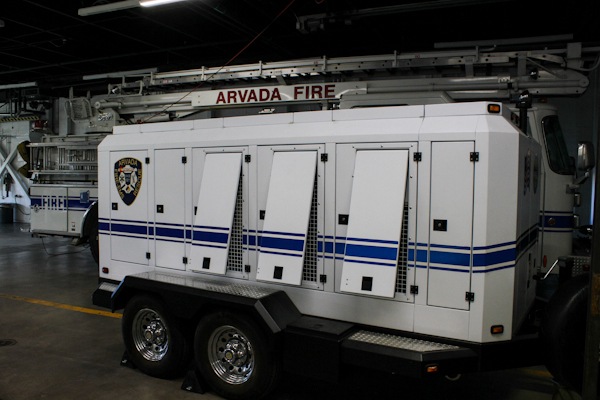 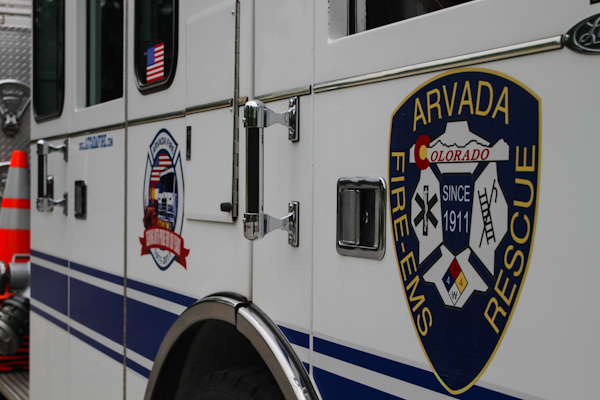 Haz-Mat 4 is also part of the Adams and Jeffco Hazardous Response Authority. 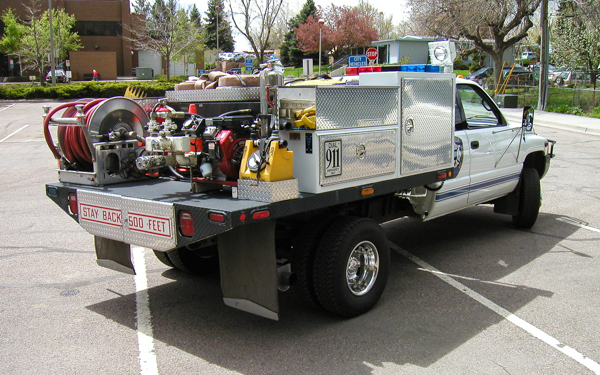 (Mobile Air Trailer) 2008 Bauer air compressor used to refill SCBA bottles that fire fighters wear on their backs. 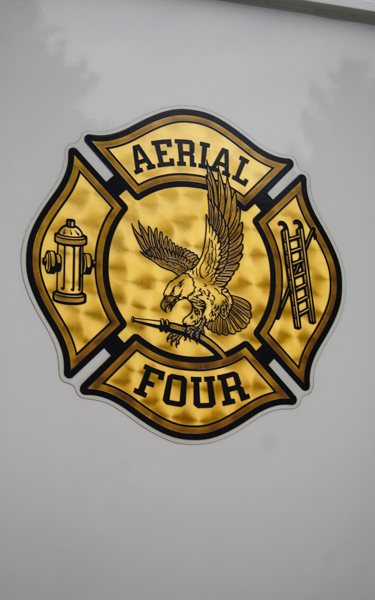 Air 56 has a four bottle cascade system that stores air at pressure of 6000 psi. 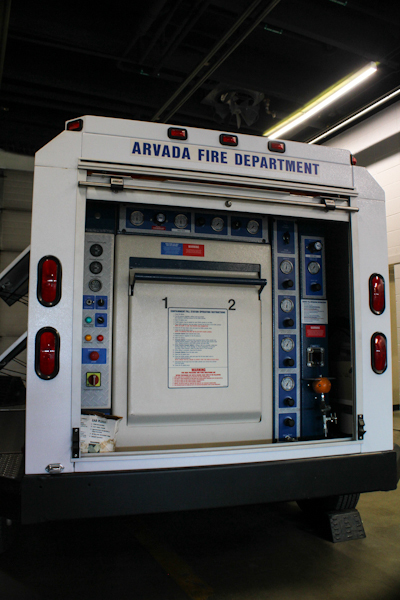 The system uses normal outside air that is dehumidified and pressurized. 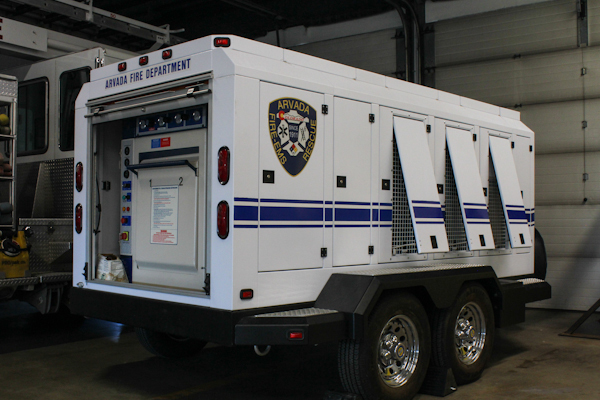 The unit is self-contained and can operate on a diesel motor or an electric motor. 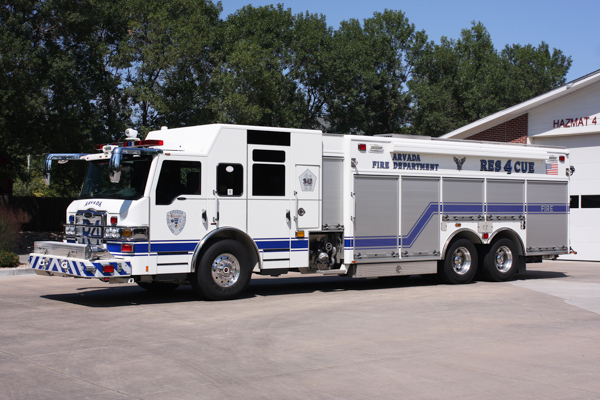 The flexibility of a mobile unit allows for use at multiple locations or on site for long duration incidents, also ran as Air 56. 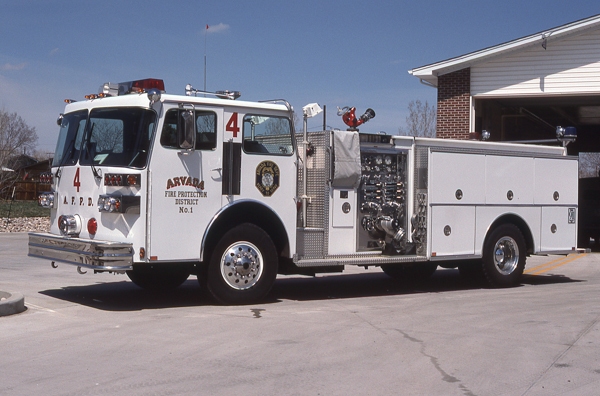 (EB340) 1998 Pierce Lance (EB-340) 75′ Tele-Squrt (Reserve) 400 gallon water tank / 1500 gpm pump with 20 gallons of foam, also ran as Aerial 4, Truck 4 and Truck 54. 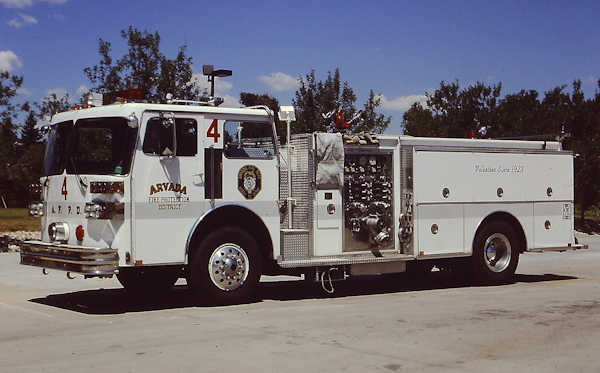 Shown here running as Truck 54. 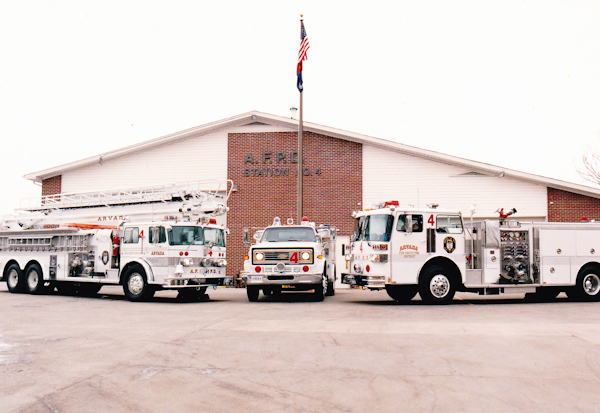 Fire Station 4 shown here at it’s current location at 6845 68th Ave. 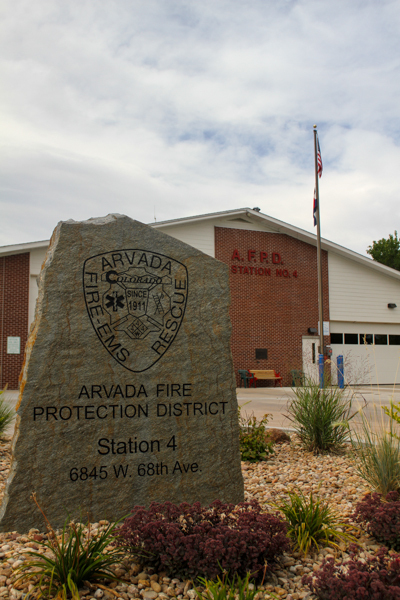 The site was purchased by the district in January of 1962 and dedicated in 1963, renovation in 2014. 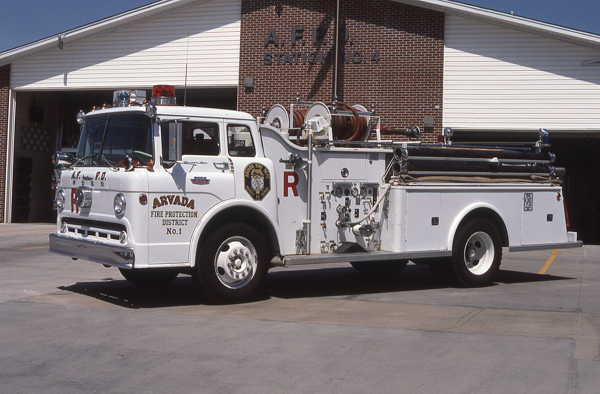 1960 Ford C850 / General Safety 500 gallon water tank / 750 gpm pump. 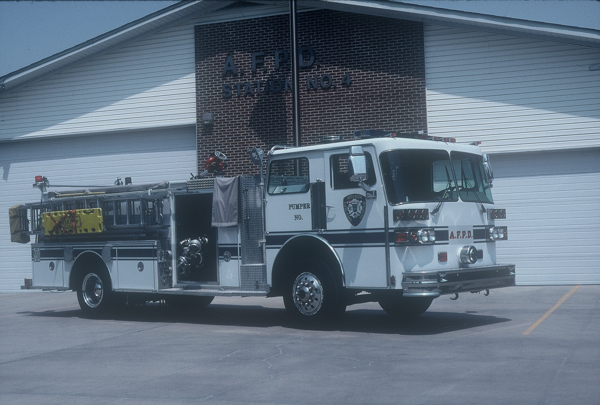 1965 Ford C850 / General Safety (23659) 400 gallon water tank / 750 gpm pump, former Engine 106 at Station 1. 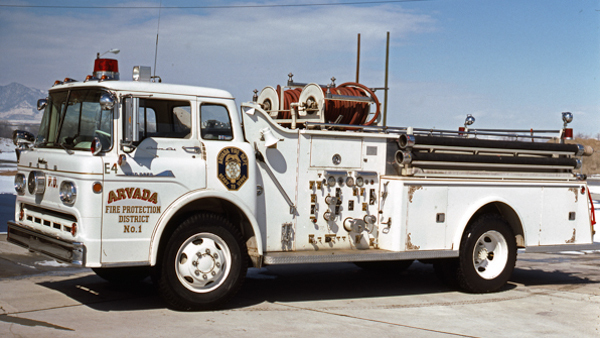 1976 Ford F-600 4×4 / E-One 250 gallon water tank / 500 gpm pump, also ran as Rescue 4. 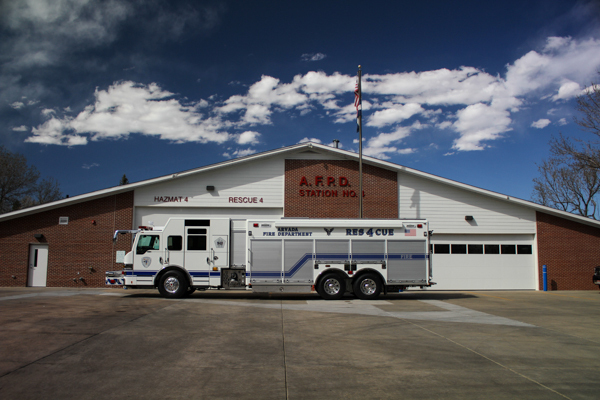 Shown here running as Rescue 4. 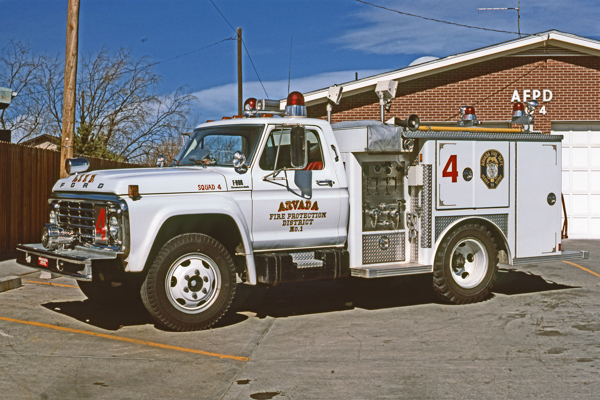 1977 Oshkosh (A-1834-301 / 15834) / Pierce Snorkel (9501-C) 75′ TeleSqurt rear-mount 300 gallon water tank / 1250 gpm pump with foam, also ran as Aerial 2, and is currently Limon Area Fire Protection District Quint 2230 and repainted red. 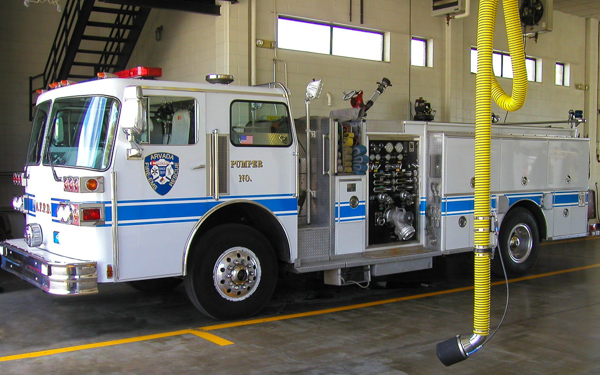 1985 Sutphen Deluge (HS-1976) 500 gallon water tank / 1500 gpm pump, also ran as Engine 4, Reserve Pumper 6 & Reserve Pumper 8. 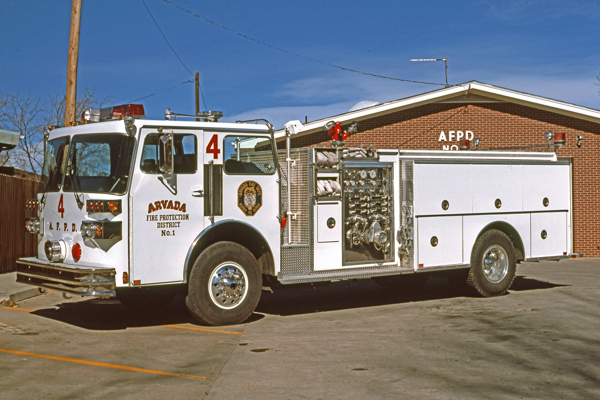 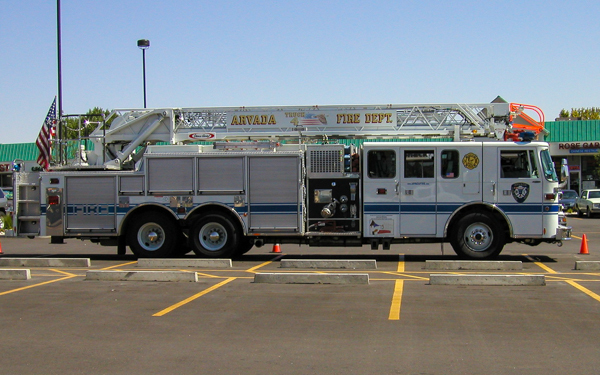 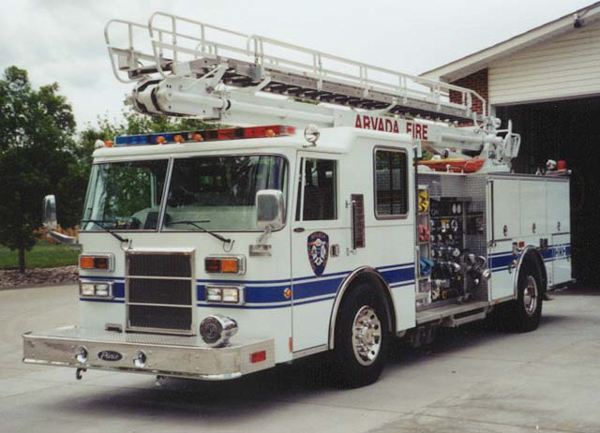 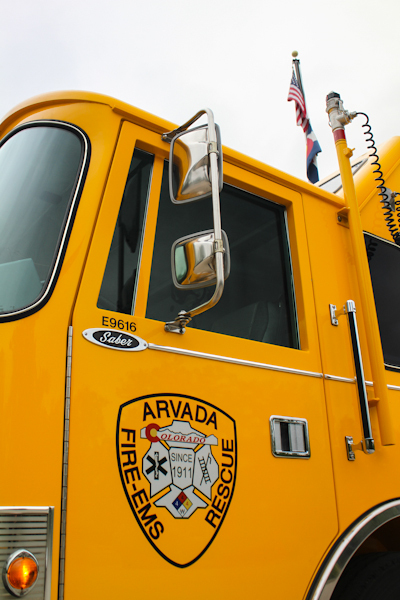 Pumper 4 was donated to the Fort Garland Fire District in Costilla County, Colorado in 2007. 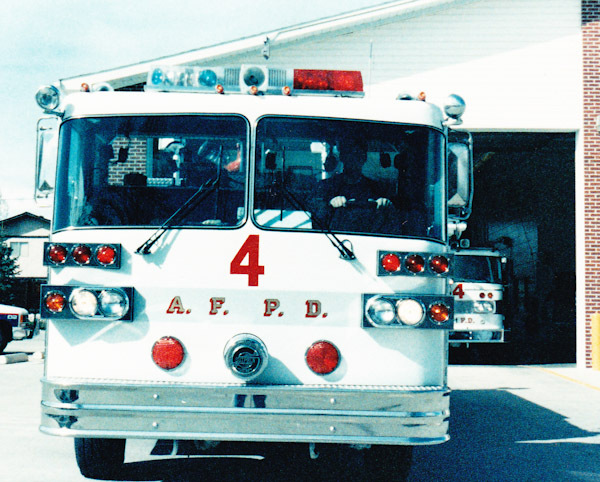 Shown here running as Engine 4. 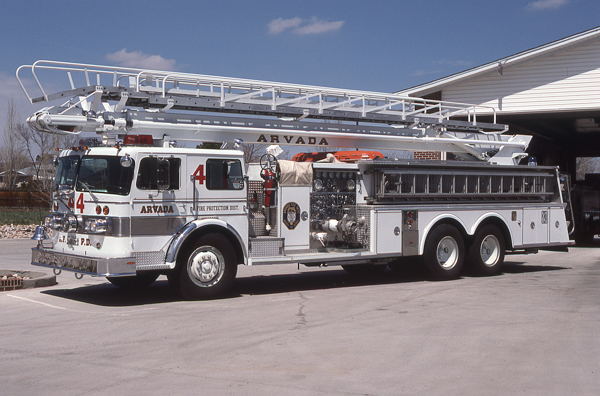 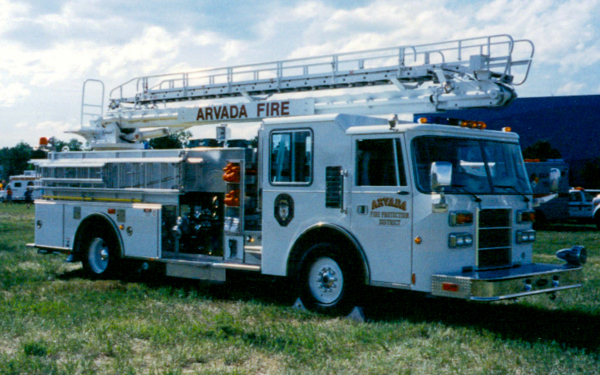 1993 Pierce Dash 50′ TeleSqurt 500 gallon water tank / 1500 gpm pump, rear cab door model, a unique unit in Colorado, also ran as Squrt 7 and Squrt 54. 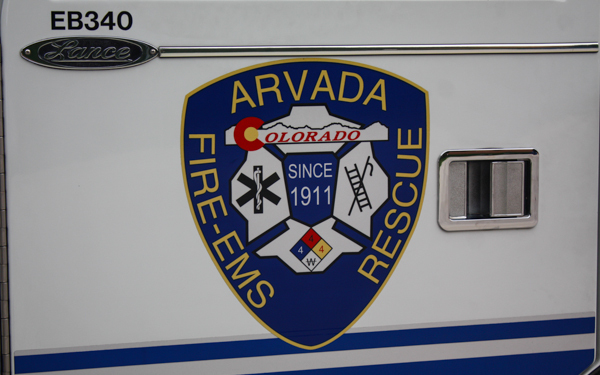 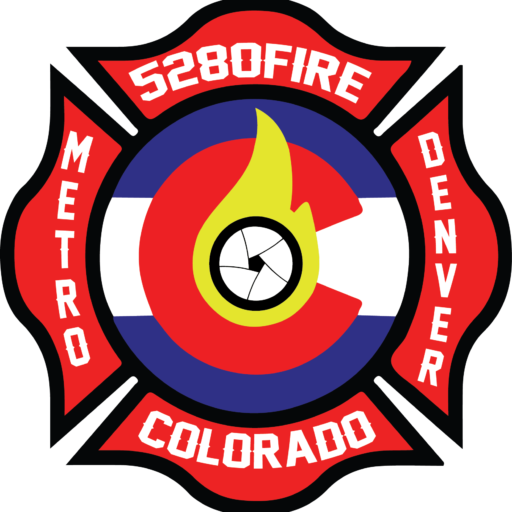 Shown here with the newer logo and blue stripe. 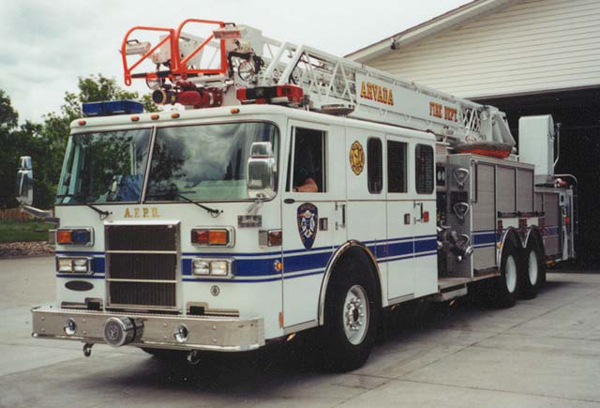 1998 Pierce Lance 75′ TeleSqurt 280 gallon water tank / 1500 gpm pump with 20 gallons of foam, also ran as Truck 4, Truck 54 and Ladder 54. 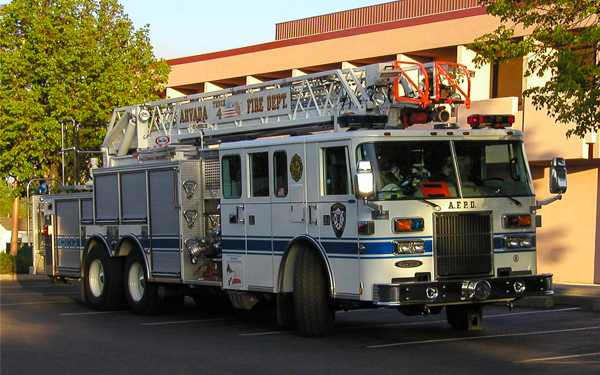 1998 Pierce Lance 75′ TeleSqurt, also ran as Aerial 4, Truck 54 and Ladder 54. 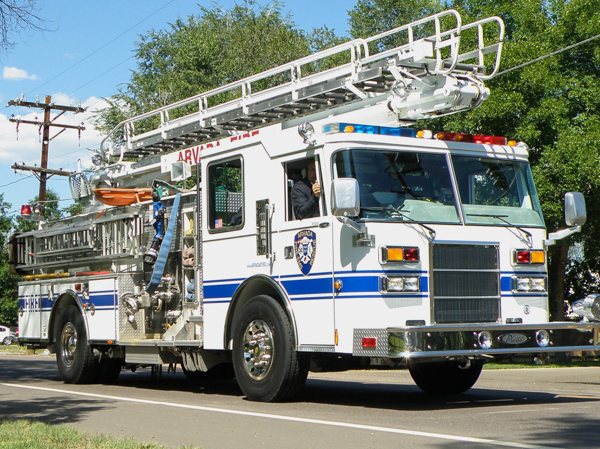 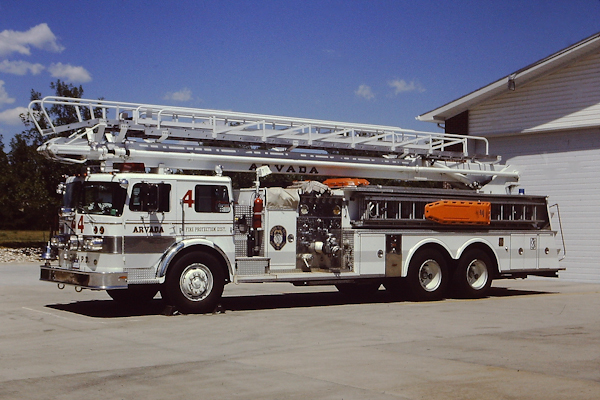 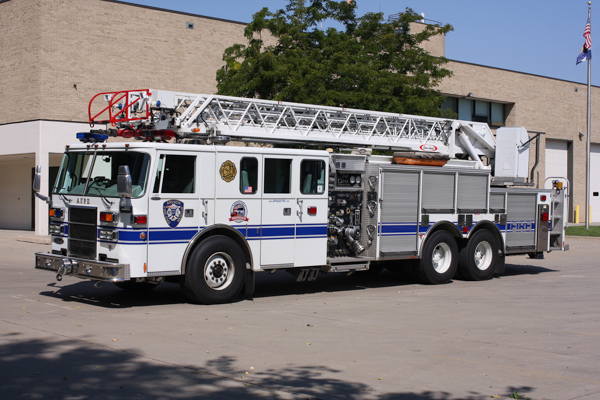 (EB340) 1998 Pierce Lance 75′ TeleSqurt, also ran as Aerial 4, Truck 4 and Ladder 54. 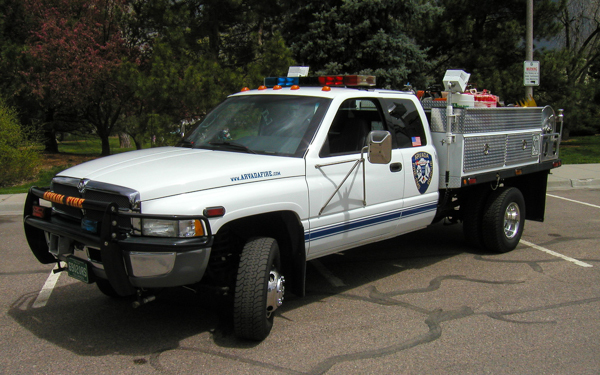 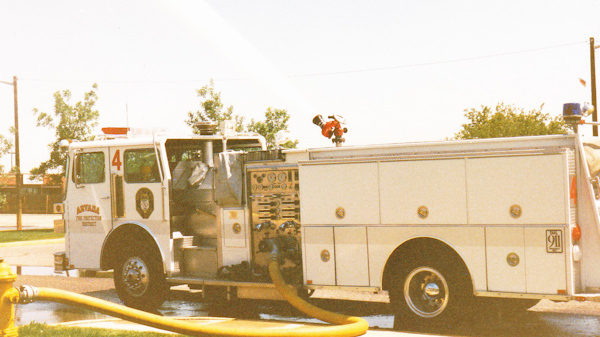 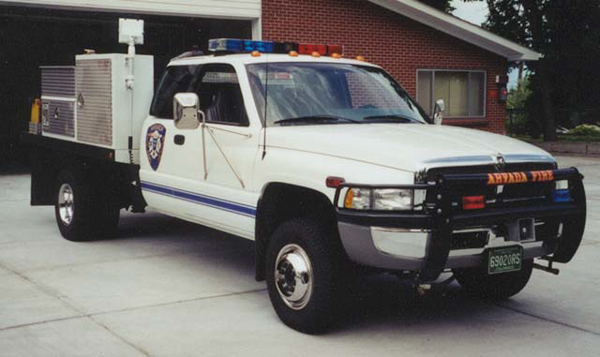 1997 Dodge Ram 3500 4×4 250 gallon water tank / 75 gpm pump, also ran as Brush 1 & Brush 7. 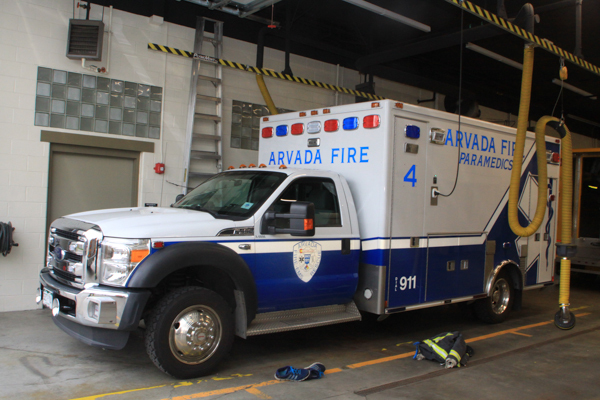 (A-0006) Ford F-450 4×4 XLT Super Duty / MedTec. 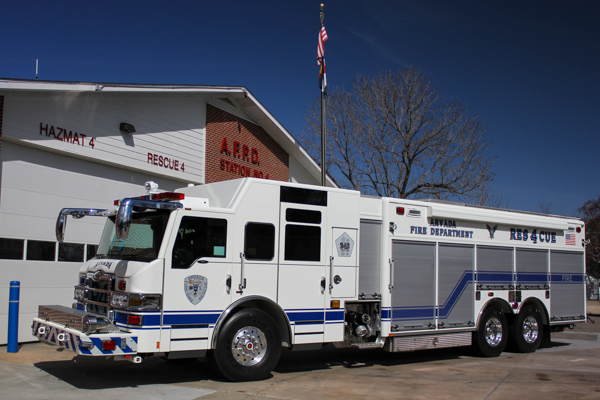 (R-0001) 2015 Pierce Velocity PUC (27880) (Heavy Rescue) 400 gallon water tank / 1500 gpm pump with 20 gallons of foam (Husky), currently Rescue 52. 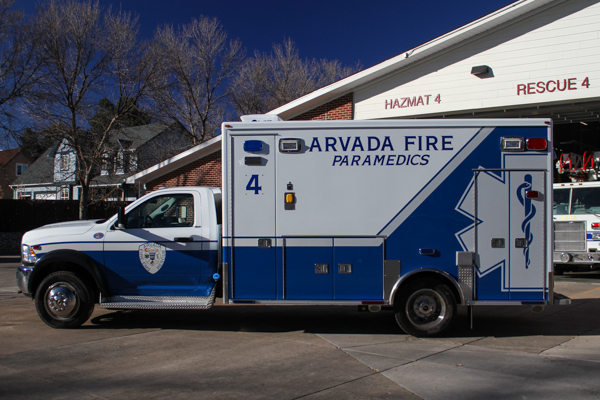 Rescue 54 carries hydraulic extrication tools, structural collapse equipment, saws, cutting torches, and various forcible entry tools.